While mosques in Morocco (with a few exceptions) are off-limits to non-Muslims - a vestige of French colonial times, the medersas* (religious schools) accept visitors for a small fee. 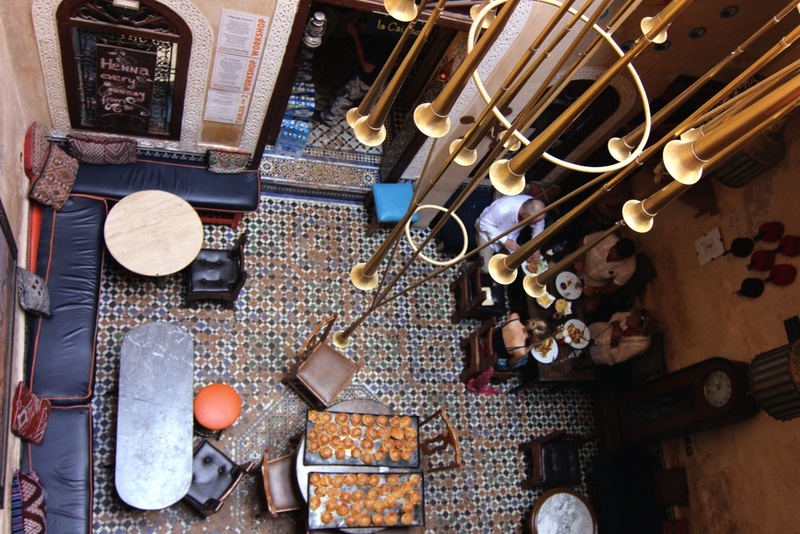 I wish I had discovered them sooner because they offer a much-needed respite from the pushy merchants and fake guides that seem to cover every inch of the medina. You can sit, sip water (something I feel too self-conscious doing in front of all the fasters) and admire the incredible Islamic architecture and mosaics. In the afternoon I caved and hired a car to take me up the hill above the old city to see the Merenid Tombs (not really tombs but ruins of an old castle). I had planned to just go on my own, but the hostel staff warned me it wasn't safe. How dangerous can a panoramic viewpoint be in broad daylight? Apparently there are still some cave-dwellers up there, and travelers have been mugged before. But besides, with the temperature in the mid-90s I lacked the motivation (not to mention the proper footwear) for a hike. As we wound our way up towards the ruins, the guide explained to me the lay of the land - the white tombstones of the cemetery that cover the bottom of the hill, the Berber mountains where olive trees grow, the caves where people still live, etc. It was breathtaking at the top, albeit burningly hot. 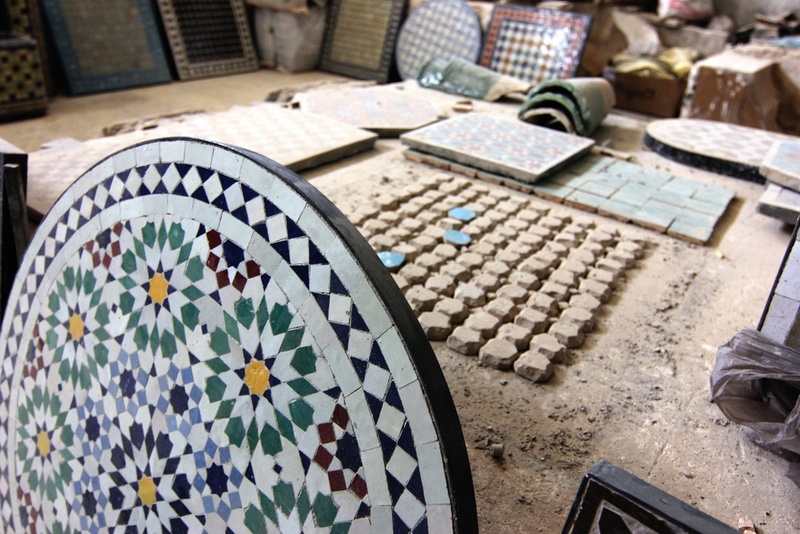 Our next stop was a ceramics factory outside the medina, which I let the driver talk me into visiting because having seen hand-painted dishes and intricate mosaics everywhere, I was curious to see how everything was all made. The day before I had stepped inside a leather workshop and witnessed all manner of bags being stitched, trimmed and embossed. The obvious skill required and the dismal working conditions made me feel less outraged by the astronomical asking prices that shopkeepers open the haggling with, but something tells me that the money is probably not distributed in a very egalitarian manner. 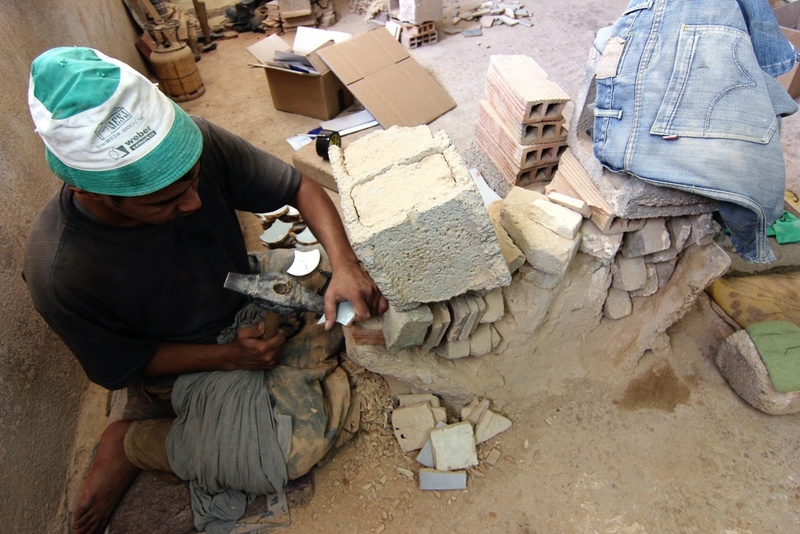 The ceramics factory itself was fairly empty due to Ramadan, but a handful of artisans remained. It's quite something what they can achieve just using a chisel - from chipping away at a blue-glazed vase to create a design with the exposed clay to creating stars and other shapes for mosaics. Yet as fascinating as the tour was, the entire time I was bracing myself for the inevitable hard sell at the end. The owner would have loved it if I had purchased a custom mosaic table or fountain (or both! ), but in the end I left with a pair of tiles. I ended the day with a refreshing iced mint tea from Café Clock, playing with the little bits of mosaic tile that the owner had let me keep. I thought back to how a boy - probably not much more than eighteen or so - had cut the perfect star in just one minute. I mean, hell, what can I do in one minute? Nothing nearly as productive, that's for sure. Below, some shots from my last day in Fez. See the rest here. 1. The gorgeous Medresa al Attarine. 2. View of the medina from the Merenides. 3. The kid who cut the star. 4. Mosaic table in progress. *I have also seen it spelled 'madrasa.' Not sure which is correct. If you know the answer send me a message!